What Is A Rat Rod Bike? Are you looking for a new motorcycle building project and want something that is easier than some bike projects, and yet is unique? If this sounds like you then you should really think long and hard about the prospect of building your very own rat rod motorcycle. A rat rod bike is very special for many reasons from its interesting design and look to the way in which a person can build one of these magnificent motorcycles. What A Rat Rod Bike Is! For the uninitiated the rat rod motorcycle looks like something out of a cartoon because of its stretched appearance and the high, drop handle bars that give the bike a rat like appearance, hence the name rat rod chopper. 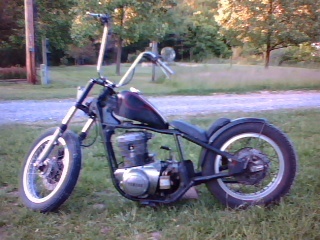 The central part of the rat rod chopper is its frame, this is generally a stretched frame low to the ground that has a high section for the gas tank in front of the seating area with the gas tank sitting under the top of the frame. The back wheel is very close to the frame and sits right under the rear of the sit so you are sitting very far back on the bike. The front forks of the rat rod motorcycles are often elongated and sit at an angle so the front wheel sits far in front of the frame, because of this the handle bars also sit at an angle and come up very high with drop handles. The motor sits at the bottom of the frame just in front of the seating section and the exhaust tends to come from the bottom of the motor and extend out under the seat just above ground level. The interesting part of building a rat rod chopper is the fact that you need very little motorcycle parts to do this. You can build a rat rod bike with a frame, motor and some wheels, the rest can generally be made up of bits and bobs found elsewhere. It's a cheaper build, yet has cult like appeal. Having such an elongated design that brings cartoon motorcycles to life and the fact that you can build a rat chopper from literally anything makes this style of big extremely unique and also a very entertaining project to undertake. 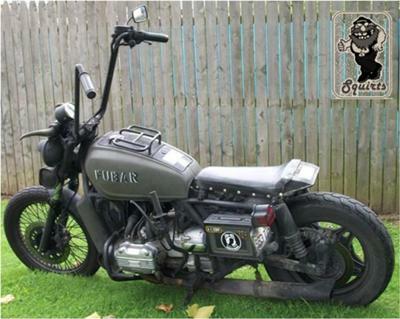 If your looking to get your hands on a very aesthetically pleasing bike that stands out and is a pleasure to ride then why not think of making your next bike a Rat Rod Motorcycle.